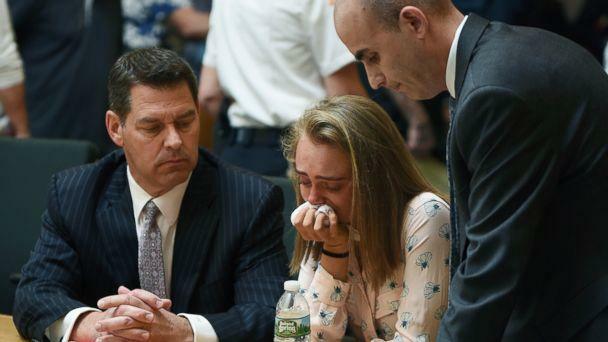 Michelle Carter, who as a teenager sent texts urging her then-boyfriend to commit suicide three years ago, has been found guilty of involuntary manslaughter by a Massachusetts judge, who described her behavior as "reckless." Carter, 20, broke down crying in court, putting her head in her hands, before Judge Lawrence Moniz announced the verdict. Involuntary manslaughter is defined as an unintentional killing resulting from recklessness or criminal negligence. Conrad Roy was 18 when he died in July 2014 of carbon monoxide poisoning after locking himself in his truck. During the trial, the prosecution claimed Carter, then 17, was reckless and caused his death by telling Roy to get back in the car even though they say he didn’t want to die. While announcing the verdict today, Moniz said that Carter instructed Roy "to get back into the truck well knowing of all of the feelings he [had] exchanged with her, his ambiguities, his fears, his concerns." "This court finds that instructing Mr. Roy to get back in the truck constituted wanton and reckless conduct," Moniz said. The judge also noted that Carter admitted in texts that she took no action; she knew the location of the truck and did not notify Roy's mother or sisters. Since she has made all prior appearances, the defense requested today that Carter not be taken into custody and remain on bail. The judge agreed but added restrictions including: She cannot leave the state of Massachusetts, cannot use Facebook or Snapchat and is prohibited from texting. During the trial, Carter maintained her innocence, her lawyers arguing, "Conrad Roy was on this path to take his own life for years." Prosecutor Maryclare Flynn argued in opening statements that Carter "used Conrad as a pawn in a sick game of life and death for attention." The testimony of several of Carter's classmates supported the prosecution's argument that Carter didn't have many friends and pushed Roy to suicide to get more attention. According to testimony, on July 12, 2014, the day of Roy's suicide, Carter texted a classmate, "He just called me and there was a loud noise like a motor ... I heard moaning ... I stayed on the phone for like 20 minutes and that’s all I heard. ... I think he just killed himself." On July 14, according to testimony, Carter texted a classmate, "I do blame myself, it's my fault. I was talking to him while he killed himself." On July 21, Carter texted a classmate that Roy's mother told her that detectives were going through Roy's belongings. "They have to go through his phone and see if anyone encouraged him to do it," Carter texted. "I’m done. His family will hate me and I could go to jail." Carter texted a classmate in September 2014, "I could’ve stopped him." Carter texted that she and Roy were on the phone the day of his suicide in July when Roy "got out of the car ... he was scared." The defense argued that Carter had previously tried to talk Roy out of harming himself and the defense pointed to one conversation where Roy told Carter he regretted dragging her into his plans to kill himself. A digital forensic analyst who testified for the defense said Roy had searched online for ways to commit suicide. The analyst said that on July 11, 2014, Roy sent a website screenshot about carbon monoxide to Carter. That day Roy also sent Carter an image of a portable generator. "It is not a homicide," lawyers for Carter said. The defense added, "Even if somebody supports another individual in a suicide, it doesn’t create a homicide." Carter was charged as a youthful offender, which means that even though she was a minor at the time of the incident, she was charged as an adult. Her sentencing is set for Aug. 3. The maximum possible sentence is 20 years. ABC News' Joseph Diaz contributed to this report.